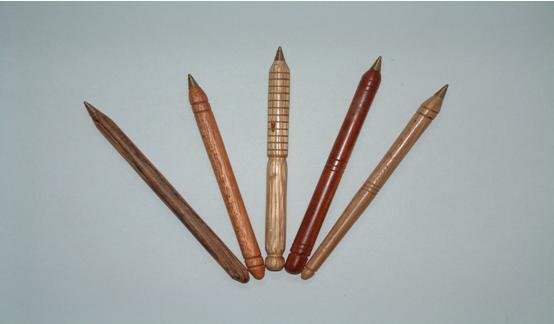 A useful way of using odd lengths of wood and which also sells well at craft stalls are wooden pens using BIC refills. You do need one special piece of kit, namely a long 4mm drill bit which is long enough to drill a 125mm hole. In Southampton I was recently able to get a 160mm long 4mm drill bit from Buck & Hickman on Southern Road by Dock Gate 10. What is needed is 150mm x 17mm x 17mm of any straight grained hard wood. My method of drilling the blank is to mount a Drill chuck in the headstock and drill by pushing the wood by hand into the drill bit. I start the long hole using a short standard 4mm drill bit before changing to the long one using a tool rest as a guide to keep the wood parallel with the lathe bed. You do need to frequently withdraw the wood from the bit to avoid it binding and the hole needs to be 125mm deep. The problem with using such a long this drill bit is that it does not always stay in the middle of the wood and then when turning you are liable to hit the hole. The way round this is generally attributed to Reg Slack from Derby. You mount the wood on the drill bit on the lathe and let it spin. Then with a pencil you can mark the centre on the end. This is the spot for a suitable drive centre. Most of the time this is successful and avoids a side blow out. It is then a straightforward matter to turn the pen with the hole at the tailstock end. There is an endless choice of styles available and I usually use a melamine finish. You can turn them fat or thin, straight or curvy, it is up to you. Everyone of mine is different! The minimum diameter at the ballpoint end is 6mm. With a pair of pliers you can usually break the clear plastic of the Bic pen to extract the refill. The refill is then inserted into the hole and hey presto the pen is complete.